In the Food & Wine Test Kitchen, we're always testing out new gadgets and products. 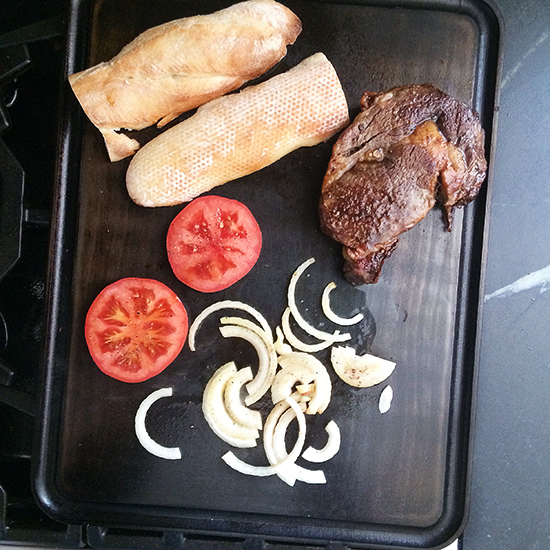 Find out how we put our newest kitchen obsession, a two-in-one pizza stone/griddle from Baking Steel, to the test. In the Food & Wine Test Kitchen, it isn’t uncommon for us to try out new gadgets and sample new products. Our latest obsession is a 25-pound slab of steel that not only works as a pizza stone but, once flipped, converts into a fully functional stovetop griddle. This amazing new product by Baking Steel is an upgraded version of their wildly successful namesake. When the original Baking Steel came out in 2012, pizza fanatics everywhere rejoiced at the thick gauge steel and the high thermal capacity that allowed them to cook up airy, crispy pizzas right in their own homes. But why stop there? Andris Lagsdin, the creator of the Baking Steel, decided to improve upon his original idea. He claims the new iteration "can do it all"—so we decided put it to the test. First, we tried breakfast: pancakes, eggs and bacon. Since steel distributes heat so evenly, the griddle browned the pancakes to the perfect shade of golden, fried the eggs to a delicious diner-style runny, and with the help of the built-in grease channel, cooked the bacon to extra crispy. But maybe breakfast was too obvious a test for a griddle? When lunchtime came, we threw on sliced onions. The efficiency and heat conductivity of the steel caramelized the onions in less time than a skillet could. The griddle then turned out perfectly crisp midday grilled cheese sandwiches. Dinner was another story. We wanted to find out about the griddle's searing capabilities. Its exceptional heat capacity gave our hanger steaks a hard sear on the outside while keeping the meat a juicy medium rare inside. The smashed potatoes were no different: the consistent high heat gave the potato skins an even golden brown crust. The griddle is one of the heaviest pieces of kitchen equipment on the market, but we didn't mind: it can easily be placed on the stovetop and used throughout the day. Just use a spatula to scrape off any stuck-on bits; any additional cleaning can be done with the back of a sponge and soapy water. The Baking Steel Griddle is on pre-order now and set to launch in September.